A full day course aimed at adults who would like to be self-sufficient on introductory Via Ferrata Courses. Maybe you're heading off on an adventuring trip, or would just like to learn more about this amazing sport. 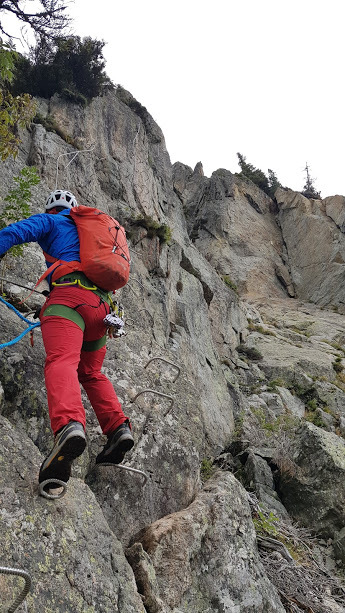 This full day Learn to Via Ferrata Course is aimed at adults who would like to be self sufficient on introductory Via Ferrata trails. 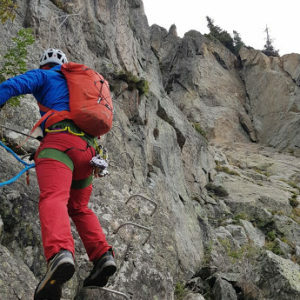 The aim of the course is to assist participants in developing the correct techniques, knowledge and confidence to complete basic Via Ferrata such as those found in the south of France. How Stean Gorge are lucky enough to host to 1 of 3 the Via Ferrata Courses here in the UK, our site is an ideal venue to learn all the skills required to get you up and running. To maximise your learning this course has a maximum ratio of 6 participants to 1 professional instructor, this enables more 1:1 time consolidating your skills. The course will be of a mostly practical nature and will take place at our Via Ferrata here at How Stean. For the theoretical aspects we will take advantage of our spectacular events space and cafe, complete with glass floor and top of the range facilities. The course will start with introductions and a brew at 9am, and we aim to be finished by 5pm. See the Itinerary tab below for a detailed run-down of the day’s events. Please call a member of our team on 01423 755666 or email info@howstean.co.uk with your required date . This course is ran by one of our Mountaineering or Caving technical experts and we will need to ensure one is available for your course dates required. For this course to go ahead we require a minimum of 2 participants, £120pp inc your lunch & refreshments. • Emergency equipment carried in small rucksack: Warm layer, waterproofs, food, water, headtorch, suncream, 1st aid, phone, map/ compass e.t.c. • Use of lanyards for safety, progressing on; vertical, horizontal and diagonal. Resting. • Use of pulleys on tyrolean traverses. How to progress, how to brake. • Use of rope for extra security. Attaching and shortening the rope. Moving together horizontally. Belaying vertical sections. • Regaining cable. Use of sling. • Etiquette. Considering other users. • Phone, numbers and emergency services. Your instructor will provide you with a Medical / Consent Form on arrival.